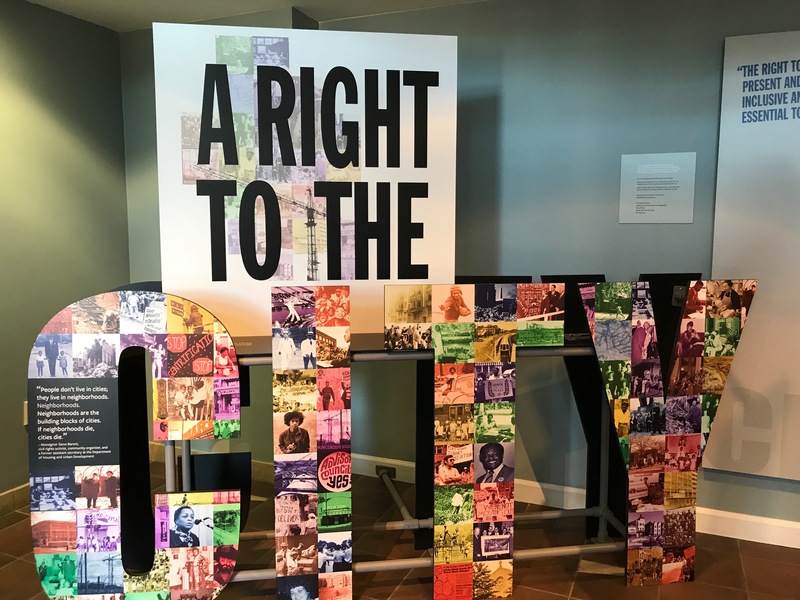 An enthusiastic crowd of more than 1200 people poured into the Smithsonian Anacostia Community Museum for the opening night of the new exhibit, “A Right to the City.” Buzzing with energy, the space accommodated an eclectic mix of installations and experiences, all of which helped illuminate Washington DC’s rich history of neighborhood organizing and transformation. Our repurposed payphone helped anchor the end of the exhibit. Participants could listen to some of the oral histories gathered by Smithsonian researchers as part of the exhibit. 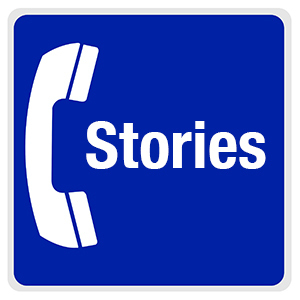 Having recently moved to DC from Toronto, the man at the phone is excited by the idea of hearing stories about his new city. Curious to see how passersby would engage with the phone, I captured some photos and conducted a few brief interviews. A payphone provokes surprise. As one said, “Oh, it actually works? I thought it was a prop.” Others kept their distance, seemingly perplexed at the sight of an old phone in a standalone space. Preparing to call in was possible without using the phone. A handful of people didn’t touch the phone but instead took photos of the board beside it that outlined instructions on how to call-in and listen to stories. They also took the informational business cards on the side of the phone with similar instructions. Intrigued yet intimidated… and wanting time to offer something valuable. 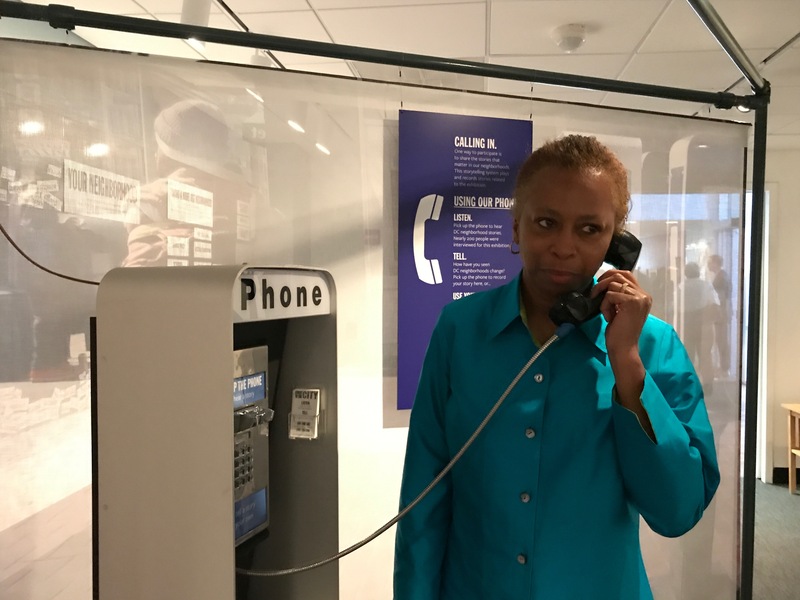 When I stepped in to explain what the payphone is all about, a common response was one of intrigue and intimidation. People were interested in participating but felt they needed time to truly participate. They wanted to think about what story they could tell or consider finding a friend or family member who would be a “more appropriate” storyteller. This woman has attended the 19th Street Baptist Church in DC for decades. 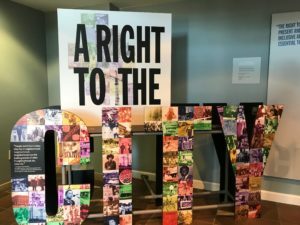 She said a project like this will be very important, in a similar way to the oral history project at the National Museum of African American History and Culture. After growing up in Northwest DC, the man at right moved to Maryland to find more affordable housing. 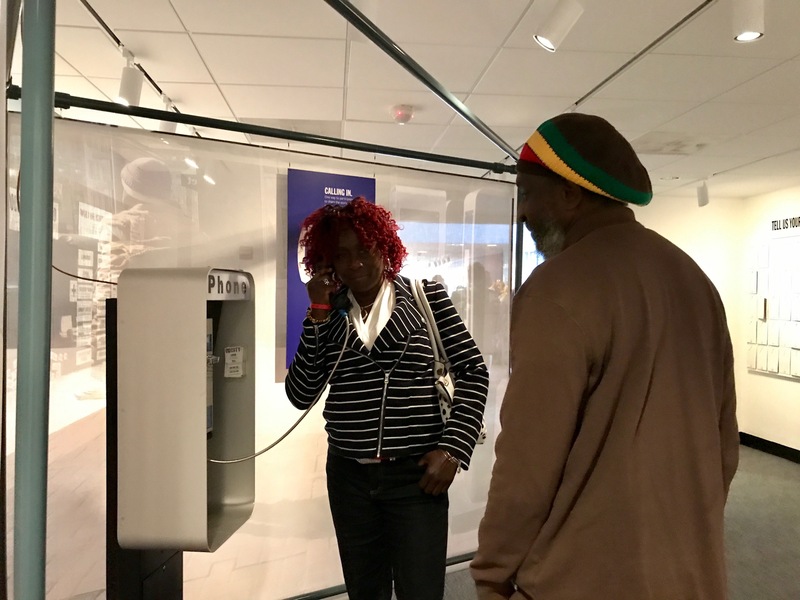 He said he “barely recognizes the city anymore” and plans share his story by calling into the payphone soon. Overall, it was fascinating for me to witness the responses and questions posed by patrons. 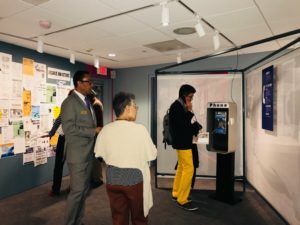 Although the payphone was only a small part of the evening, it prompted some important dialogue that will, hopefully, contribute to the bigger conversations the exhibition seeks to have – those about neighborhoods, community transformations, what it means to have a story, and what it means to situate your personal story in the many changing stories of your city.